I recently went back at Tout Va Bien, a French restaurant Midtown with an interesting kind of overdone decor and a nice atmosphere filled with French music. Not the best French restaurant in town, but it serves a pretty decent food with prices that are not outrageous. 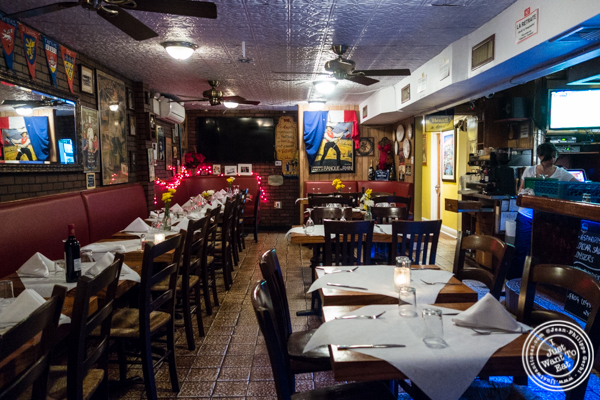 Tout Va Bien has been feeding the New York crowd since 1948, a longevity that cannot be ignored for sure. First, I should mention the veggie plate that they brought to the table. I thought it was to replace the bread: not at all as a bread basket came right before the dishes were served. I admit that I was disappointed with the bread that was chewy, proof that it was not fresh...I mean, bread is a staple in France and you cannot have some decent one in a French restaurant??? Then I got foie gras. I admit that there I was a bit confused as I am sure it was supposed to be a crème brûlée foie gras, different from what came. Unfortunately, I could not verify on their website as the menu was not up to date. It was just ok, not as dense as a bloc de foie gras should be. For the entree, I decided to go for a classic bistro dish: steak frites. The steak, a NY strip was ordered medium rare and came slightly on the medium side. But still, it was good (do not expect a steakhouse quality though). It came with a salad and delicious fries, and I also ordered a nice Roquefort sauce on the side. For dessert, I could not resist ordering an île flottante (aka œufs à la neige or floating island), a dessert not often proposed on menus. It was decent, the eggs being a bit dense, but the vanilla sauce being delicious. Overall, it was an ok meal, not something that will stick in my memory if I am thinking about a good French place in New York. It was fine but I think I should have ordered the escargots and the veal kidney that is delicious there.